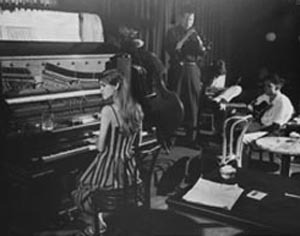 Carla Bley, Steve Swallow, and Bill Folwell play at Phase 2 on Bleecker Street in Greenwich Village, early 1960s. (Photo by Paul Hoeffler). For the past five decades, Bley has worked extensively with such jazz luminaries as Charlie Haden, Steve Swallow, Paul Bley, and Gary Burton, as well as collaborated with artists ranging from multi-instrumentalist Don Cherry, to Jack Bruce and Pink Floyd drummer Nick Mason. Bley is also known for the classic 1971 jazz opera, Escalator Over the Hill, an epic composition featuring the surrealist words of poet Paul Haines and 53 of the most original jazz and rock musicians of the era--including Paul Motian, John McLaughlin, Gato Barbieri, and former Mothers of Invention member Don Preston. “There are no other books about her,” noted Beal, chair of the music department at UC Santa Cruz. 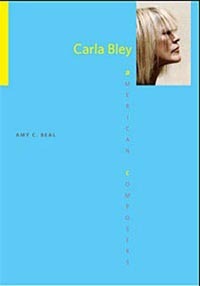 Beal’s Carla Bley has just been published as the seventh book in the American Composers series (University of Illinois Press)—the first woman and the first jazz composer spotlighted in the series, which also includes studies of Lou Harrison, John Cage, and Elliott Carter. Highly respected as composer, arranger, and performer, Bley’s music runs the gamut--from the traditional-based and highly accessible, to the experimental and avant garde. Bley was also a pioneer in the development of artist-owned record labels, co-founding and managing her own recording studio, record label, and distribution service. Throughout her career, she has sustained a degree of artistic control that is extremely rare for any American composer, particularly in the world of jazz. Both a music historian and performer, Beal specializes in 20th-century and American music. She is the author of New Music, New Allies—American Experimental Music in West Germany from the Zero Hour to Reunification (University of California Press 2006). 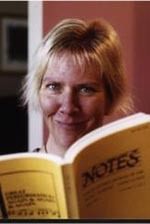 Beal also directs the Contemporary Music Ensemble, a student group at UC Santa Cruz. She noted that the ensemble will perform the music of Carla Bley, along with UCSC music lecturer and noted bassist Stan Poplin, at a concert set for March 11 at the UCSC Music Recital Hall.